Home > Retro Reflections > Retro reflections: I have an arcade cocktail cabinet and my life is complete! Retro reflections: I have an arcade cocktail cabinet and my life is complete! There’s an event on in Sydney every year; the Royal Easter Show, which is a massive event run, in the main, to showcase Australia’s agricultural produce and culture to the city (and state). These days it's also about a range of general attractions, of course, and as part of the event there are numerous markets, where small businesses come and set up shop to get their wares in front of the huge crowds. It’s an event that I go to every year, and for the last decade, at least, I’ve been lusting a cocktail arcade cabinet by a company that specialises in these things. They’re pricey, but as a lifelong fan of games I’ve wanted one for obvious reasons. Throw in the build quality of the best tables, and it’s also something I’ve been willing to wait for - I could have got cheaper models, but I wanted to specifically buy one of the good ones. I’ll only ever buy one of these things, so I figured I’d best save my pennies for when I could get exactly the one I wanted. And now I have it, and I couldn't be happier. This table has it all; it can be played one or two player, side-by-side, or end to end. Side-by-side is obviously there for playing fighting games, and there are six buttons and a control stick for this purpose. The end-to-end format is more appropriate for SHMUPS, or games like Space Invaders or Frogger. Because you need less buttons for these kinds of games, the end-to-end controllers only have the three buttons to go with the control stick. As you’d expect for such an investment (the table’s worth just shy of $3000 Australian), the build quality of everything is exceptional; the buttons feel superb to press, there’s a thick sheet of glass over the top, which I will forever be terrified of getting scratched (I have a thing about scratches on my screens), but I know that there’s no way anything’s getting under the glass to damage the screen underneath. Naturally, there’s no coin slot; there’s a simple button that I can mash like crazy to load up coins on whatever game I’m playing. That button is my new favourite button. Oh to have that button back when I was a kid in the arcades of my youth. Mind you, I almost wouldn’t have minded if there was a coin slot; this thing could have been a superb excuse to save up some more money. If the machine only played games, that would be one thing, but it’s actually more than that, which is a neat bonus. The machine runs on an Android operating system; the screen is effectively an oversized Android tablet that you can’t touch. This does mean that it has Internet connectivity, and access to the Google Play store, so I can download any games that can be played without touch screen controls. There’s also a Web browser in there, and because the machine has some pretty darned good speakers, it will make for a handy jukebox and music player when I've got a party going on. But, of course, the main reason to have this table is going to be there for the games, and I really love my arcade cabinet. It runs MAME for Android, and on the machine I’ve got a bunch of games in just about every genre; enough to last me and that retro reflections article series on DDNet for many years into the future, let’s put it that way. Playing games using arcade buttons is a different experience; not one that everyone prefers to gamepads, once you get past the initial excitement of the tactility of arcade joysticks and buttons, but certainly for fighting games, twitch arcade games, and so on, arcade controls will forever be a natural and enjoyable way to play. So now I basically have a new favourite way to play games. A bottle of wine or a beer or six (on coasters, naturally, no drink rings on my table! ), the flicker of arcade graphics of old, and those incredible MIDI music compositions; it’s heaven. Afterwards, I can use the table to play a couple of rounds of a card game (Final Fantasy TCG is great, everyone), or as a study table, or anything else, really. This was a pure indulgence and luxury purchase on my part, but it has been totally worth it, and I’m looking forward to many years of utter frustration in trying to beat games, back when they were genuinely hard. 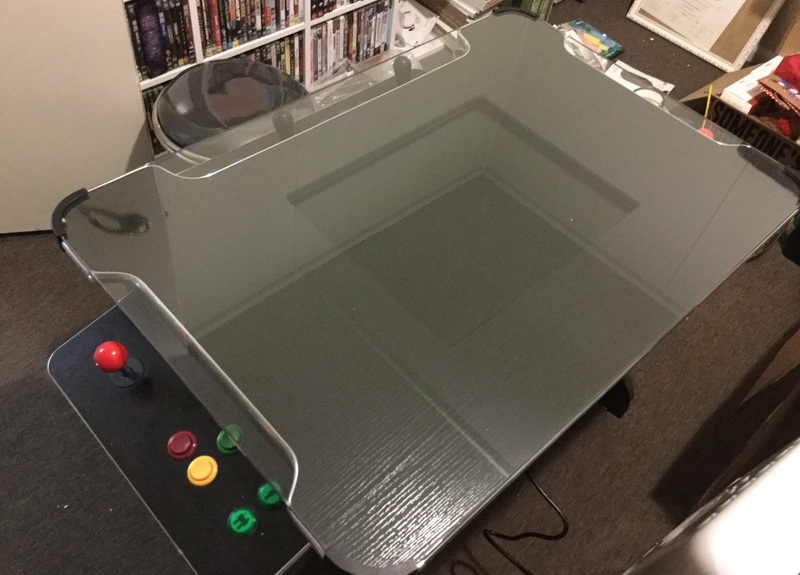 (And yes this article is in part simply because I wanted to enthuse about my new best friend, but in all seriousness, if you are a fan of older games, then investing in one of these tables might seem expensive, but the sheer joy you'll get in return is totally worth it).